Supercharge your workflow with ChartMogul. We’ve revamped customer lists to be customizable, savable and all-around awesome. When you think about the value ChartMogul provides, you probably think about the metrics we calculate and visualize. And you’re not wrong. But ChartMogul power-users know that one of our most useful features is our Customers page, where we aggregate every lead, active customer, past due customer and cancelled customer and allow you to explore their payment history. Similar to the rest of ChartMogul, users can apply filters and segments to look at specific customer views. However, until now you would have to bookmark the URL in your browser or recreate your view when you needed it again. I’m excited to share that we’ve revamped your customer lists to be customizable, savable and shareable. Edit Columns: You can now choose which columns are displayed. In addition to ChartMogul’s built-in attributes, you can also select from your custom attributes. You can also rearrange the order in which columns are displayed and set the default sorting of each column. Save List: Once you’ve created a list you want to reuse, you can save it to your ChartMogul account. By default, lists will be saved to the individual user’s account. If you’re an admin, you can choose to share your new list with everyone on your account. You can of course update (or delete) a list once it’s been created. Customers based in the USA! Any customers who has a discount. Shows you customers with more than one active subscription. We set this to any customer paying over $1,000 per month. If you’re a B2C business, or just selling smaller deals, you’ll probably want to adjust that threshold. Any customer up for renewal in the next 7 days. Customers that are past due on their payment. An unhappy list, everyone who was once a subscriber, but sadly cancelled. All leads with a ‘free trial started at’ value, who’ve haven’t yet purchased a subscription. We’ve taken this opportunity to also re-vamp the export functionality of the Customers section. Previously when you exported the customers list you actually got a CSV containing subscriptions (one subscription per row). 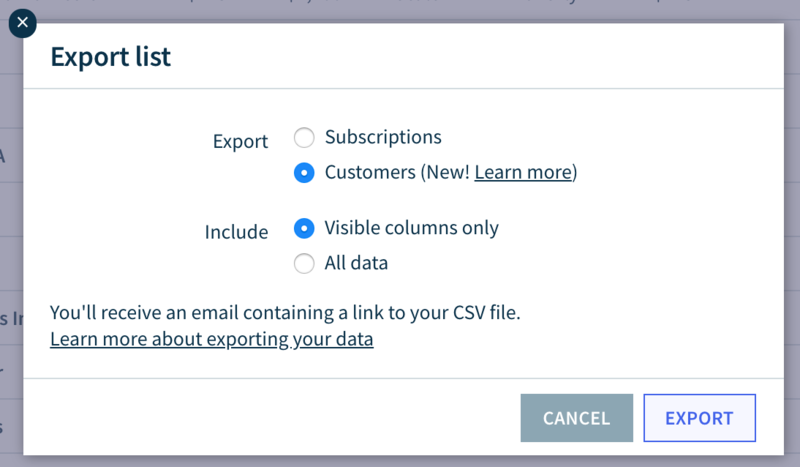 We’ve kept that export option available (we don’t want to break anyone’s workflow), but now you have the option to export Customers instead, and also include either the visible columns, or all available columns (including custom attributes and tags) associated with your customers. We know how useful solid export functionality is to our power users so we’re really excited to be releasing more robust export options with this release. Customer lists are available to all user on a paid ChartMogul plan. If you’re new to ChartMogul, start your 14-day free trial and get access to all Scale plan features. 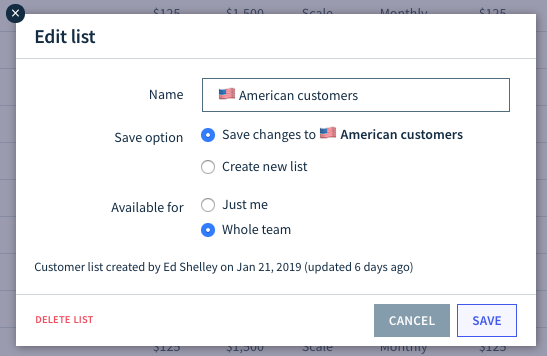 If you’re on our free Launch plan and want to upgrade to Scale in order to take advantage of the customer lists feature, then your account owner will need to head over to your billing page > click “Adjust subscription” and switch you over to the Scale plan.